I’m at the Amari again, this time to preview the Ramadan buffet, themed Warisan Tradisi Asia where diners may enjoy a range of the best of Asian specialties at the Amaya Food Gallery. I’m sure the hotel will stay true to its Thai brand and present an exciting range of authentic Thai dishes specially prepared by Thai Chef, Kanokwan Pungjaroenkijkul, better known as Chef Gina. Chef Gina and her talented culinary team has created an interesting concept of a bustling local street scene in the Amaya Food Gallery, complete with live-cooking stations and self-serve stations. The hotel has invited some 150 corporate guests for the launch of the Ramadan menu and while waiting for their arrival, I zero-in on the Thai section of the buffet for a closer look. I read the labels next to the dishes to discover mouthwatering dishes like Thai-style Baked Fish, Thai Pandan Chicken, Thai Beef Green Curry, Thai Chicken in Tamarind Sauce, Stir-fried Shrimps with Dried Chillies and Cashew Nuts, Half-shell Mussels with Lemongrass and Pok Tak Talay Soup. Intrigued by its name, I make a mental note to try this Thai soup before any other item on this exciting buffet of over 100 dishes (served in a rotating menu) from Western, Thai, Indian, Chinese and Malay cuisines. In a quick tour of the buffet (I’m familiar with the restaurant layout!) I check out the dishes in the Chinese, Malay and Indian sections, as well as the desserts and drinks. Besides juicy dried dates, there is a choice of thirst-quenchers like Nescafe Tarik, Teh Tarik, Sirap Bandung, Sirap Selasih, date juice, fresh sugarcane juice and soyabean juice. I cannot miss the attractive pile of whole prawns, mussels and scallops in the Seafood-on-Ice counter and the colourful fresh greens plus ulam-ulam, keropok crisps and jars of preserved fruits in the salad and appetizer section. In the Chinese and Malay section, there are traditional favourites like Chicken Bubur Lambuk, Ayam Masak Merah, Ikan Patin Tempoyak, Udang Goreng Kunyit, Ikan Bakar (Grilled Fish), assorted dim sum, Yong Chow fried rice, Fried fish fillets in Nyonya sauce, Wok-fried chicken with ginger and Chinese mixed vegetables. Amari Johor Baru Area General Manager, Dean Rossilli, is invited to beat a gong to signal the start of the event and its resounding echoes certainly captured everyone’s attention. 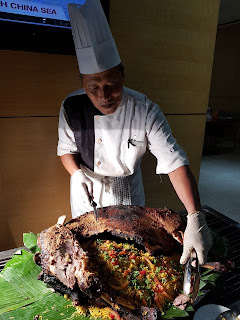 Using long-handled paddles, Rossilli, along with Consul General of Indonesia, Pak Haris Nugroho, and UM Land Hospitaity CEO, Siewkoon Ng, stirred a cauldron of Gulai Kawah beef stew as a gesture to launch the Warisan Tradisi Asia Buffet. Diners are cordially invited to enjoy the buffet spread so I head to the soup section to help myself to a small portion of Pok Tak Talay. I hear the pleasant strains from a traditional gambus and throughout this meal, the tunes from a live ghazal band continues to entertain. Then I sit down to discover that Pok Tak Talay is a mild, spicy seafood soup with a tasty mix of seafood and mushrooms tinged with lemongrass, ginger, basil and lime flavours. With my appetite suitable whet by this spicy soup, I visit the live-cooking stations for a taste of Roasted Whole Lamb, selection of Satay, Murtabak, Roti Canai, Tandoori Chicken, Soup Berempah and Gulai Kawah (Rendang Kawah Rusa) and Nasi Impit served with Sayur Lodeh and a choice of Beef, Chicken and Coconut Serunding. Other live-cooking stations are serving Thai Laksa and a choice of Noodle Soup as well as popular fried snacks like Cucur Udang, Curry Puffs, Fried Durian Fritters, Fried Bananas and Fried Cempedak. The meal is certainly not complete without a sweet ending. There are local dessert broths like Bubur Pulut Hitam, Bubur Cha-Cha, Bubur Kacang Hijau and Pengat Pisang as well as a range of pretty puddings, jellies, kueh, pastries, cakes and cookies. On Fridays and Saturdays, diners can watch a live demonstration of traditional rattan weaving by physically challenged staff from the Johor Area Rehabilitation Organisation or JARO, and may support this charity in the spirit of Ramadan, by buying their beautiful handicrafts. The Warisan Tradisi Asia Buffet will be served at Amaya Food Gallery from May 19 to June 14, daily from 6.30pm to 10.30pm. Enjoy Early Bird deals of RM102 nett per person and RM51 nett for children aged six to 12 years and seniors aged 60 and above, when vouchers are purchased before May 1. After May 1, prices are RM128 nett per person and RM64 nett for children aged six to 12 years and seniors aged 60 and above. Buy five  adult vouchers, get one voucher for free! Amaya Food Gallery also serves a Sahur Buffet from May 19 to June 14, daily from 3am to 5am. Priced at RM53 nett per person and RM26.50 nett for children aged six to 12 years and seniors aged 60 and above. Hari Raya High Tea Buffet from 3pm to 5pm at RM78 nett per person and RM39 nett for children aged six to 12 years and seniors aged 60 and above. Hari Raya Aidilfitri Buffet Dinner from 6.30pm to 10.30pm at RM98 nett per person and RM49 nett for children aged six to 12 years and seniors aged 60 and above. The Amaya Food Gallery is on the sixth floor, lobby level of Amari Johor Baru at No. 82-C Jalan Trus, 80000 Johor Baru. Driving access is only from Jalan Trus while pedestrian access is convenient from Jalan Wong Ah Fook. For reservations, Tel: 607 – 266 8888 or email: amaya.johorbahru@amari.com. When I saw the invitation to the Ground-Breaking Ceremony for the Indian Heritage Centre at the Arulmigu Raja Mariamman Devasthanam Temple, my thoughts flashed to my story on Johor Baru’s Street of Harmony that features this temple among other places of worship in my book, My Johor Stories:True Tales, Real People, Rich Heritage. Just as immigrants from race groups like the Chinese, Sikh, Ceylonese, Javanese and Arabs arrived in Johor to seek their fortunes, the Indians found employment here as labourers and supervisors or mandore in rubber plantations developed in the outskirts of Johor Baru in the early 20th century. A mandore* in Sultan Sir Ibrahim Abu Bakar’s plantation at Pasir Pelangi appealed to the sultan for land to build a temple to meet the religious needs of Indians and a site was granted at Jalan Ungku Puan. *Born in 1887, this man was Kutha Perumal Vandiyar, who had settled in Johor Baru and realized that Hindus here needed a temple to meet their religious obligations. Vandiyar was privileged to have a close friendship with the then ruler of Johor, Sultan Sir Ibrahim, and it was said that they would often have tea together. When Vandiyar approached the sultan for a place to build this temple, His Royal Highness magnanimously granted him an acre of land at Jalan Ungku Puan and also contributed M$500, a sum of money worth more than RM10,000 towards the construction expenses. Vandiyar, with the help of other Hindus, built the original temple and when it was completed in 1911, the word, “Raja” was incorporated into its name as the Arulmigu Raja Mariamman Devasthanam Temple, in honour of the sultan. The original temple has since been demolished. Over the years, the new building (1986) was upgraded and expanded with an adjacent multi-purpose hall, usually used for weddings, a row of flower shops, a meeting room and a carpark in its compound. In June 2011, the temple marked its 100th year anniversary with a grand celebration. This property, which occupies the site at No. 1-A Jalan Ungku Puan, is a popular tourist attraction and a heritage landmark accorded the coveted status as a Heritage Religious Institution on the Persiaran Muafakat Bangsa Johor route by the State Government. The plan to add an Indian Heritage Centre to its property is an exciting prospect and when it is ready, this will be the first of its kind in the city. On my way to the event, I walk pass the flower shops in front of the temple grounds and notice that they have recently had a facelift. This project, I later learnt was accomplished with the support from Think City Johor Baru. I enter the temple compound and am greeted by my friends with a warm welcome. I’m ushered to the event site where (I’m told) a religious ceremony will take place before the Ground-Breaking Ceremony, to be officiated by Guest-of-Honor, Member of Parliament for Johor Baru, Tan Sri Shahrir Abdul Samad. I’m glad that I’m among the witnesses of this historical event, where the first brick will be laid by Tan Sri Shahrir, to symbolically start the construction of this Heritage Centre! Two years ago, Tan Sri contributed the sum of RM200,000 to the temple to kick-start the project and in 2017, more funds were raised from a charity dinner to boost the building fund for their Heritage Centre. Now they are ready to construct a tw0-storey building at a total cost of about RM1 million, designed to showcase the vibrant history of the Indian community in Johor since the days of its pioneers. The temple aims to promote greater awareness and appreciation of Indian heritage – first to the Indians and also among fellow citizens and visitors – through valuable artefacts, art and cultural exhibits and events, with an emphasis on traditional musical instruments. Speaking of musical instruments, my reflections are interrupted by the dramatic beats of a traditional Indian drum and the fanfare from a traditional Indian trumpet! This signals the prompt arrival of Guest-of-Honour, Tan Sri Shahrir. Temple president, K. Kiruppalini, and members of the temple committee usher Tan Sri to his seat where he joins us to witness the religious ceremony happening at the site of the future Heritage Centre. In his speech, Kiruppalini thanks Tan Sri for his generous support and explains that the Heritage Centre project includes refurbishment of the flower shops as well as upgrading the meeting room and multi-purpose hall. Based on the work schedule, he said the construction should be completed by 2019. For the Ground-Breaking Ceremony, Tan Sri leads the number of participants who handed one brick each to the temple priest who then ceremonially placed the bricks as the foundation inside a pit, dug into the ground. According to temple tradition, Tan Sri and the participants are honored by having a sash tied to their foreheads and a flower garland placed around their necks. Tan Sri congratulated the temple committee on the occasion and said that the Heritage Centre will be a wonderful addition to the character of Johor Baru as it will add value to the temple attraction. He is pleased that the Heritage Centre will soon become a reality and it will stand as a legacy to the Johor Indian community by offering opportunities to all sectors of the community to better appreciate and understand Indian cultural practices and heritage. “Kepada semua!” Tan Sri exclaims in Malay [translated: “To all!”] and goes on to explain that it is his policy and practice throughout his career as a politician, to support the needs of our multi-cultural community. From the loud applause, the appreciation from the Indian community is apparent. In addition to an event souvenir, they also presented Tan Sri with a traditional garland and wrapped a beautiful shawl across his shoulders. The event closed with light refreshments. And while I’m enjoying Indian delicacies like vadai and kesari, a South Indian sweet made from semolina that’s usually served for special events, Kiruppalini is sharing more details about the temple’s plans. He said besides valuable artefacts, the Heritage Centre will also showcase the temple’s golden chariot. The building project will also include the construction of modern toilets designed to cater to the elderly and physically challenged, an elevator as well as living quarters for temple priests. The temple is not only a place of worship as they also oversee an Education Fund for needy students and a Special Charity Fund to help single mothers and needy families annually. With an annual cultural events calendar that organizes classical dance classes, yoga classes, kolam contests and the Ponggal Festival, the temple is a center that develops a healthy and vibrant community that contributes positively to the state and nation, as a whole. “So colourful!” this is my recurring thought when I spot the eye-catching food display set up at the entrance to Seri Mutiara Restaurant. The centerpiece is a wooden tray designed in the shape of the hotel logo – branches of an outspread palm tree – with each limb filled with a variety of coloured preserved fruits and clusters of dried dates. In the lobby in front of the restaurant entrance, a wooden platform reminiscent of a kampong house is created for a serving staff to sit on the floor to prepare freshly-fried local snacks and kueh or traditional cakes from a (portable gas!) stove. The staff is (of course) dressed in traditional Malay costume and looking very at home as she personifies how mothers would lovingly prepare dishes for the family’s breaking-of-fast meal during Ramadan. But here, the platform is a banquet table to serve desserts in an array of local sweets, puddings and kueh, spread on a traditional woven with mengkuang leaves. Nearby a chef is skillfully carving a roasted whole lamb for diners to savour with fragrant baked Beriani rice. At the drinks counter, another set of skills catches my attention. A young man is pulling-tea the traditional way to thoroughly mix chilled milk tea. He skillfully pours the milk tea from one receptacle he holds high above his head, into another receptacle (held on his other hand) in front of him to create a good head of froth which he serves on each tumbler of chilled Teh Tarik. I take a walk around the restaurant to check out the buffet spread and watch the excitement from live-cooking stations, the served station – like adding a scoop of ice-cream onto your cones – as well as self-serve stations where diners create their own shaved-ice concoction for Air Batu Campur or cendol. I’m familiar with the hotel and observe how the buffet menu comprises a wide range of local favourites and a selection of Western dishes and I even recognise contributions from their award-winning Meisan Szechuan Restaurant. There are popular items like Roasted Chicken in Mongolian sauce, deep-fried Sea Bass in tom-yam sauce and Beef with ginger and spring onion, among other favourites. I spy soups, salads as well as a section for sushi. Then I spot an extra-large platter. Curious about it, I approach for a closer look and I see assorted seafood on it. Then I realise that it’s a serving of Seafood Paella! In the range of local cooked food, I find a number of familiar mouth-watering delicacies including Kambing Assam Pedas Johor, Rendang Tok Ekor, Ikan Merah Masak Lemak Cili Api, Kentang Tempe & Madu and Sayur Goreng Jawa. While the Seri Mutiara Restaurant may have earned an enviable reputation for good food, they are not willing to rest on their laurels. They have, in fact, tweaked the recipes of popular items like Murtabak and Roti John and added them into the five rotating menus served this Ramadan. This year, diners can look forward to tasting their Murtabak Ikan Tenggiri (stuffed with fish instead of meat!) and Roti John Black Pepper Ayam (chicken). Diners can also taste folds of Taco stuffed with choices of chicken, beef or shrimp fillings. Another new item to savour is their seafood shell-out item where diners can pick between black pepper and tom-yam sauces for the chef to prepare a seafood and vegetable platter, served to your table. Other popular items in a typically Malaysian menu include freshly grilled assorted satay with condiments, Laksa Johor, Mee Rebus, Chicken Rice and freshly made spring rolls, among other favourite items. Speaking about satay, I must say that the satay here still tastes good. Grilled, tender morsels of lean meat paired with warm peanut sauce that’s neither sweet nor diluted but in a rich, viscous consistency that properly matches my taste for good satay! Warna-Warni Ramadan is served at Seri Mutiara Restaurant from May 17 to June 14, daily from 6.30pm to 10pm. of sambal sauces served in charming stone mortars! Price at RM125 nett for adult and RM65 nett for children aged between four to 12 years. Early Bird vouchers may be purchased at RM108 nett per adult, while stocks lasts. On the first day of Hari Raya Aidil Fitri, June 15, Seri Mutiara Restaurant serves a festive buffet High Tea [RM75 nett per adult and RM45 nett per child aged four to 12 years] and festive buffet Dinner [RM95 nett per adult and RM65 nett per child aged four to 12 years]. The Puteri Pacific Johor Baru invites you to share the spirit of Ramadan with a veritable feast at their Fiesta Ramadan spread in The Puteri Café. Located on the lobby level of the hotel, The Puteri Café looks familiar even though the view through its floor-to-ceiling glass walls has new buildings in a new and different city landscape. I’m at the hotel for a media preview of the Fiesta Ramadan at the invitation of Director of Sales, Joyce Yap. I recently met Joyce again at an event held at the adjacent Persada Johor International Convention Centre and it’s good to renew my acquaintance with Johor Baru’s most central business hotel. I join a large group of corporate guests who are also here for the preview and am delighted to be seated close to the buffet where I can watch guests helping themselves to their favourite dishes. As she shows me around the various sections of the buffet, Joyce tells me that this is the last time we will be dining in The Puteri Café in its current setting. That’s because the hotel will be embarking on a major refurbishment project, not only to equip it with new facilities but also to upgrade it with modern elegance and luxury. This is indeed a timely project and I cannot wait to experience the all-new Puteri Pacific Johor Baru in the near future! Meanwhile, my nostrils are assailed by the enticing aroma of freshly cooked food from the live cooking stations. I make a beeline for the Lamb Kuzi, a whole lamb roasted with the finest herbs and spices and stuffed with fragrant basmati rice. I watch as the chef is happily carving and serving delectable portions to diners. I remind myself to take only two spoons of rice with the Lamb Kuzi and drizzle it with the Kuzi gravy, from a separate dish nearby. Executive Chef Azamuddin Ahmad and his culinary team has prepared a menu of more than 100 items for the Fiesta Ramadan, ranging from appetizers, soups, main course items and desserts in the best of Malaysian favourites with a blend of cuisines from around the world. Nearby, the Chinese chef is stir-frying flat rice noodles, better known as Char Kuay Teow. I watch as he skillfully cracks two fresh eggs onto the pan – followed by an additional egg (which I recognize from its lighter coloured eggshell!) – a duck’s egg! As all connoisseurs of Char Kuay Teow know, it’s the duck’s egg in these stir-fried noodles that makes all the difference to its tempting taste! Selections of Halal dim sum served at Kai Xuan Chinese Restaurant, is also presented in the Fiesta Ramadan menu. Savour the dim sum with a choice of dip sauces like chillie sauce to a mild sweet sauce. More guests are arriving and while Joyce leaves me to welcome them into the café, I wander off to the barbecue section. Here the chefs are grilling meat and seafood at a work station which is separated by an opaque glass wall. There is an opening for diners to pass their selections to the chefs but it’s wise to have this wall which helps to reduce the sizzle and smoke from the dining hall. Nearby at the Pasta section, diners can pick their choice of pasta, ingredients and sauces for the chef to prepare, fresh for their enjoyment. In the cooked food spread, there are choices of local Malay and Chinese favourites as well as Western items. An entire section is dedicated to serving dates and a range of preserved fruits. Several jars with air-tight lids are filled with a variety of crisps. I just hope diners will be considerate to keep the lids fastened for the crisps to remain crispy! Keeping to the tradition of breaking-of-fast with family at home, there is also a section that serves a range of appetizing sambal sauces to go with a selection of ulam-ulam or fresh kampung greens as well as a choice of tossed kerabu or Malaysian salads. Then I discover another staple for the breaking-of-fast - Bubur Lambuk – and this comes with toppings like chopped spring onions and croutons as well as spicy dark sauce, like the type used for soto or chicken soup. I cannot resist drizzling my portion with a little spicy sauce. And when I taste it, I like how this rice porridge warms my belly, so tasty and chockful of cubes of tender beef. That’s because I’m distracted by the desserts… There is a range of local kueh, bubur and pengat or local sweet broths, plus cakes, pastries, jellies and puddings! This year, diners can look forward to enjoying a ‘Daily Must-Try’ item in the buffet so keep an eye out for this special addition every day. Diners at The Puteri Café also stand to win attractive prizes including return flight tickets to holiday destinations like Australia, Bali, Vietnam, Surabaya and Bangkok, in special lucky draws. Fiesta Ramadan is served at The Puteri Café from May 17 to June 14, daily from 6.30pm to 10pm. Price at RM98+ for adult and RM55+ for children aged between six to 12 years. Early Bird reservations made before May 6 will enjoy 15% discount while reservations made from May 6 to May 15 will still enjoy 10% discount. The hotel also offers a special package price for those who wish to organise private group buka puasa events under their Corporate Social Responsibility Programmes. The timer clocks click off at the start of the #LongLoaf Challenge for nine contestants who accepted the dare to eat their way through a Long Loaf Set of a 16-inch sandwich with half a kg of tasty Golden Fries within 16 minutes. It’s a contest of wills where each contestant is determined to polish off all the food from their platters served in the SDS #LongLoafChallenge 2018, in the shortest possible time. Eight men and one woman bravely chomp their way through a 16-inch sandwich stuffed with slices of ham, chicken, smoked duck and fresh vegetables, and a side of half kg tasty Golden Fries coated with salted egg – all to the cheers of supporters and onlookers. In a speed-eating contest like this, contestants are eating under pressure, chewing and swallowing with the help of gulps of water and where every bite takes them closer to winning the bragging rights as the SDS Champion Long Loaf Eater. All eyes are on the sole female contestant, Tng Mei Fong, better known as Rainbow Kumi, who earned the reputation as a gifted Female Champion Eater since 2016. Rainbow, 27, who drove to Johor Baru with her husband and 3-year old son from Malacca this morning, is no stranger to eating competitions. In 2016 she discovered her skills in speed-eating when she downed more than 30 hot dogs in a Hot Dog eating contest in Kuala Lumpur. That same year, she emerged as the Female Champion at the Muar Big-Eater Contest. In 2017, Rainbow was crowned Champion in the Food League SG Spice Contest, holding the record for finishing 4.2kg of Chicken Rice in 30 minutes and 41 pieces of Seremban Siew Pau in 30 minutes! Led by Michelle the event Master of Ceremony (MC), the crowd is roaring – with cheers of utter surprise – as they witness how Rainbow is making rapid progress, eating her way through the 16-inch sandwich in less than four (4) minutes into the contest. It’s amazing how speedily and systematically she manages to eat while the contestants seated to her left and right are chewing steadily and still have a large portion of their sandwich and fries left on their platters! 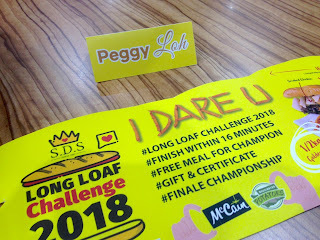 Held at the SDS Bakery & Café at Paradigm Mall, Johor Baru, the event is attracting passers-by and shoppers who are happily distracted by the excitement happening among the contestants. All smiles and ready to start the speed-eating contest! The MC draws our attention to Rainbow who has already eaten her sandwich and is feeding on the fries with the help of her bare hands, counting down the seconds in which her food is fast disappearing! In just four minutes and seven seconds (4.7 minutes! ), Rainbow polished off all the food and emerged Champion of the SDS #LongLoafChallenge event! While Rainbow receives her Champion’s award of a Drape and Certificate from SDS Marketing Manager, Alice Loh, the other contestants plough on, undeterred and ever determined to become the first runner-up. Eating their way through the contest! As the timer clock ticks its 16th minute, 22-year old Kua Zhi Jian from Skudai, polished off all the food on his platter to become runner-up of the SDS #LongLoafChallenge. The time is up and while the other contestants do not win any titles, they can give themselves a big pat on the back for giving this difficult challenge a try. For taking part in the contest, they each enjoyed a complimentary meal and are presented with a complimentary Voucher to savour a cappuccino brew at SDS Cafés. It’s truly astounding to witness how Rainbow beat eight other contestants in such a short time! And to understand her better, I sit her down along with her husband, Tan Wei Yong, for a chat. Speaking in a mix of Mandarin and English, she tells me that this morning when they arrived from Melaka at about 9am, they enjoyed a local breakfast. Rainbow, who has a naturally large capacity for food, said she enjoyed two packets of nasi lemak and two packets of mee siam with her teh tarik or traditional pulled milk tea. Having just completed this speed-eating challenge, Rainbow tells me that her stomach feels only 10% full and she is ready to have a spot of lunch! She and her husband were married in 2012 and they have two children, a 6-year old daughter and a 3-year old son. She said Tan encourages her to eat and over the years, she soon discovered her ability to eat a lot of food. Tan chips in with a laugh, saying that when she was expecting, she could eat even more! From her experience in various eating contests, Rainbow has gained much confidence to take on various eating challenges. In fact, next Sunday she will be joining a hot dog eating contest in Malacca. Think you can do better? Then take up the challenge! Rainbow confessed that she was feeling unwell today. At the start, when she assessed the food on the platter, she thought that it should take her about five minutes to finish it. But she emerged the Champion when she accomplished it in only 4.7 minutes! Other champion eaters from the SDS #LongLoafChallenges held at various participating SDS café outlets from now till end June 2018 and Rainbow, will join the Grand Finale Championship in July, where the ultimate winner will enjoy 1-year’s supply of complimentary SDS Dining Vouchers! The SDS #LongLoafChallenge is organized in collaboration with McCain Food Inc, one of the world’s largest producers of frozen potato French Fries and potato specialties. Then take up the #LongLoafChallenge at participating SDS café outlets at AEON Tebrau City, AEON Bukit Indah, AEON Kulaijaya, AEON Bandar Dato Onn, KSL City, Taman Johor Jaya, JB City Square, Taman Universiti, Taman Perling and Kota Tinggi. A winners’ chart will be updated regularly on the SDS Official Facebook fan page.